Chrysler showed a rebadged Lancia Delta at the Detroit auto show to test the appeal of hatchbacks to sedan-hungry U.S. buyers. TURIN – Chrysler and Lancia will share a stand and host a joint press conference at next month's Geneva auto show in another step in the integration of the brands. The two brands have no new cars to debut in Geneva and Lancia is still considering whether to show a Chrysler-badged Lancia Delta that was unveiled at the Detroit auto show in January. 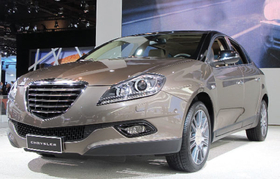 The Chrysler and Lancia brands will have a shared product portfolio in Europe with exact details of the sharing to be decided by the end of the year. Most likely, Lancias will only be sold in Italy where sales of the brand are strong, while in the rest of Europe Chrysler will sell its own cars and rebadged Lancias. Fiat, which owns 20 percent of Chrysler Group, is considering integrating Chrysler brand with its near-premium Lancia marque to expand the product offerings of both brands without huge investments. On Dec. 22, Sergio Marchionne, CEO of Fiat and Chrysler, disclosed a product plan that includes four Chrysler models imported from North America and rebadged as Lancias for launch in Italy in 2011. The four products would be versions of the re-engineered Sebring sedan and convertible, the freshened Town & Country minivan and the redesigned 300C sedan. Lancia and Chrysler are headed by Olivier Francois, a French executive who is also heads marketing for Fiat Group Automobiles and Chrysler Group. Last year, Lancia had global sales of 121,000 cars of which 102,000 were sold in Italy while Chrysler brand sold 11,500 cars in Europe.